Democratic presidential hopeful Sen. Christopher Dodd, D-Conn., speaks to reporters after addressing the Farmer’s Union summit in Des Moines, Iowa, Saturday, Nov. 10, 2007. Dodd’s Credentials: The longtime Senator from Connecticut is the son of U.S. Sen. Tom Dodd. Dodd says he takes progressive issues and makes them bi-partisan policy, pointing to the Family and Medical Leave Act, of which he was chief author, as an example. Although he voted for the Iraq War resolution, he now says he regrets it and has been an outspoken critic of the war. After his Connecticut colleague Sen. Joe Lieberman lost to Ned Lamont, a Democratic primary challenger, Dodd endorsed Lamont. 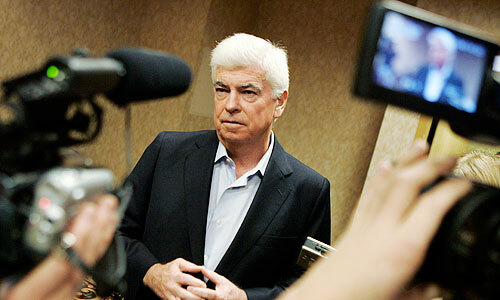 Dodd has enjoyed a mini-boomlet amongst the so-called Netroots, with his outspoken criticism of the Bush administration. He threatened to filibuster a proposed law that would give immunity from lawsuits to telecommunications companies that gave the government phone and e-mail records for the warrantless surveillance program. After the veto threat, he raised more than $150,000 from small donors in 24 hours. Not all of Dodd’s money is coming from small donors, however. As chairman of the Senate Banking, Housing and Urban Affairs Committee, he’s been able to tap wealthy contributors in the financial services industry. Place of Birth: Willimantic, Conn. Notable: Was once romantically linked with Carrie Fisher and Bianca Jagger. Dodd speaks fluent Spanish, thanks in part to a stint in the Peace Corps in the Dominican Republic. He made it home by hitchhiking across Latin America in 1968. Dodd on the Issues: A look at where Dodd stands on the issues and how he has voted. Nevada Contributions: A breakdown of Dodd’s financial contributions from the Silver State. State by State Contributions: A breakdown of Dodd’s financial contributions across the U.S.
Dodd's MySpace Page: Read Dodd's profile information and leave a message. Dodd's Facebook Page: Read Dodd's profile information and leave a message. Dodd's Flickr Page: View Dodd's latest political photos. Dodd's YouTube Videos: View Dodd’s latest political videos. Campaign Manager: Sheryl V. Cohen and more key people.